10 of the best turntables of all time | What Hi-Fi? Back in 1995, the annual What Hi-Fi? Awards issue declared that it might just be the last year that we had a turntable category, such was the move away from vinyl towards digital and the CDs... How wrong we were. The vinyl resurgence has seen vinyl sales hit a 20-year high, with 1.3 million albums sold in 2014 and 2015 sales up significantly year-on-year. But it's no good buying vinyl, if you've got nothing to play it on. As vinyl has endured, so have some of our favourite turntables. So what are the best turntables of all-time? The Dual CS505 cost £75 back in 1980 and was pitched at "hitting back at cheap decks from the Far East". It was also the first of Dual's decks to be sold in the UK without a fitted cartridge. It also boasted an "autostop and arm lift device". Not bad, eh? Its rival in 1980 was the Rotel RP-500, but the Dual came out on top thanks to sound quality that we heralded, unsurprisingly, as "second to none". It may not have been the Product of the Year, but the Little Oak turntable did walk home with an Award at the very first What Hi-Fi? Awards back in 1983. It was an unassuming and simple budget deck, that was easy to set-up and, wait for it, stayed in tune over time. The way we judge our Awards hasn't changed much so it was no surprise to find the Little Oak was picked out for offering high-class sound at a low price. In 1987, with the prospect of CDs becoming the format of choice already on the agenda, Linn carried on its turntable production with the Axis. Other than fitting the tonearm and cartridge, the Axis required little in the way of setting up. It featured electronic speed change and produced a "clean and tidy performance". Of course turntables have in fact out-lasted Linn's own CD players, which ceased production back in 2010. Rega's Planar 2 was voted Best Budget Turntable at the 1989 Awards thanks to in no small part to its £155 price tag. It may have used a manual design, but so effortless was it to change speeds, that we declared it wasn't an issue. "If you want to hear the music in the way it was meant to be heard... the Rega Planar 2 is the turntable to choose," said our Awards issue. The Planar 2's big brother, the Rega Planar 3, would go on to win four Awards, as Rega stamped its mark on the turntable category. The Systemdek IIX was so good that it was our turntable Product of the Year for three years running from 1990.. Undoubtedly one of the most iconic turntables in history and an example of a deck that has been through any number of incarnations. The incredibly striking design from Michell certainly won us over: "Even by exotic turntable standards, the Michell Gyrodec looks gorgeous," we said of this model in 1994. And it sounded the part, too, we even went as far as to say it could be almost "too revealing". Too much of a good thing, clearly. Stereo imaging was spot on and, considering its intricate looks, we noted it was actually incredibly easy to use. A genuine classic. Linn's LP12 took top honours at the 1994 Awards. A notable year, as it was the last time that turntables would get their own dedicated category right up until 2001. A sure sign of how vinyl's popularity waned when digital music first took hold. As for the LP12, another deck that has stood the test of time and appeared in many guises, we praised it's "warmth and faithfulness". It may have been expensive at £1345, but it was worth every penny. As we said in 1994, "a worthy winner of this, possibly our last ever Best Turntable Award". Erm... or not. This record player was named Best turntable in the 1999 and 2000 Awards, but both were tucked away in the Accessories category. The £109 Debut was incredibly easy to set up, and the sound it delivered for the price was "astounding". 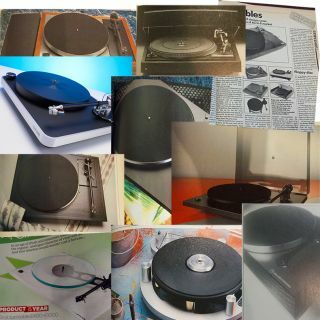 It wasn't until 2001 that turntables got their own dedicated category again, the year the Pro-Ject Debut Phono took top honours, showing how Pro-Ject has dominated the budget turntable market, right up to the present day. The Clearaudio Concept took top honours at the 2009 and 2010 Awards, and has remained a favourite since, even if it recently lost out to the Rega RP3/Elys 2 for top honours. Quite simply, there's nothing we don't like about this deck. It's very much a plug-n-play product and delivers a performance that's "little short of thrilling". As we said in 1999: "The Clearaudio Concept is a great all-rounder: it's easy to set up, easy to use and sounds great. At this price point, it's king." Like it's predecessor, the P2, the Rega RP3 has won four Awards on the bounce. And that's before we mention Rega's similarly all-conquering midrange turntable range, the Planar. No matter what genre you throw at it, the P3 will hold you in good stead and deliver great sonic results. It's incredibly easy to set up and even easier to use, and a worthy addition to our list of the best turntables we've ever reviewed. Will it win again in 2015?